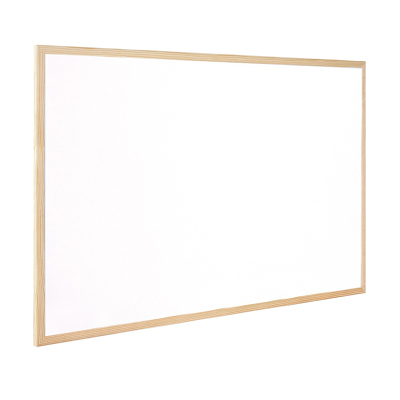 Whether you're hosting training sessions or displaying information for all to see, our Whiteboard Wooden Frame is a practical option. Designed to work well within nurseries, offices and care homes alike, this durable board can be installed on any wall or flat surface. It features a light wooden frame that pairs effortlessly with other furniture in your workplace. The high-shine whiteboard is compatible with wipe clean inks and can be cleaned in seconds using the appropriate eraser. Cutting down on maintenance time, these boards are a brilliant way of temporarily presenting any form of information to colleagues and staff while also encouraging interaction during classes. To get the best out of your whiteboard, pair it with our Whiteboard Eraser Washable and our Drywipe Markers in Black.